Gold River, B.C. (March 4, 2015) — Effective March 9, 2015, Skuna Bay, Vancouver Island Craft Raised Salmon has awarded its exclusive distribution in Washington State, Idaho, Montana and Utah to seafood distributor Pacific Seafood Group. Skuna Bay Salmon was made available initially to these markets beginning in April of 2013 but recently has made the move to Pacific Seafood after a thorough review of its distribution and service in these markets. 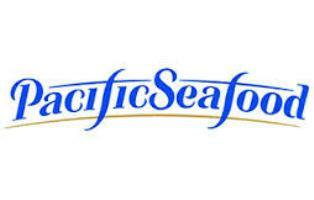 After a lengthy due diligence process, Pacific Seafood was selected as exclusive distributing partner in their area for their reputation for quality, sustainable sourcing, service and outstanding cold chain. 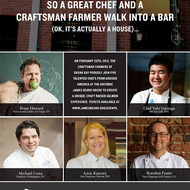 GOLD RIVER, BC (February 9, 2015)— Skuna Bay Salmon and six talented chefs from around America are to be featured at the historic James Beard House with the third annual “Salmon Seduction” dinner on February 25, 2015. The Vancouver Island Craft Raised Salmon will again be served at this special dinner by chefs representing some of the country’s most well-known culinary centers: Las Vegas, Washington, D.C., Denver, New York City and a former James Beard Award Winning Chef from Dayton, OH. Plying their talents at this special dinner will be James Beard Award-winning Chef Anne Kearney from Rue Dumaine in Dayton, OH; Chef Brian Howard from his soon-to-be-opening restaurant Harvest & Larder in Las Vegas; Chef Yuhi Fujinaga from Patina Restaurant Group’s renowned Manhattan eatery The Sea Grill at Rockefeller Center; Chef Michael Costa from legendary Chef Jose Andres’ Washington, D.C. restaurant Zaytinya; and Chef Brandon Foster from Vesta Dipping Grill in Denver, CO. Providing a special dessert will be Pastry Chef Michael Gabriel, also from the The Sea Grill in Manhattan. Gold River, B.C. (June 10, 2014) — The Craftsman Farmers of Skuna Bay proudly provided their best Skuna Bay Salmon for an official Canada Head of State dinner at Fairmont Chateau Laurier in Ottawa on Monday. Chef Louis Simard, Executive Chef at the reknowned hotel, expertly prepared a tartar for the Right Honourable Stephen Harper, Prime Minister of Canada, Mrs. Laureen Harper and the Honourable Tony Abbott, Prime Minister of Australia. The salmon selected for this special dinner were 10-12 pound farmed Atlantic salmon from the Concepcion sea farms in Nootka Sound, off the west coast of Vancouver Island. Head Farmer Steve Munro oversaw the harvest to ensure his fish were carefully handled during the process. FROM THE SAME PRISTINE, NATURAL, GLACIER-FED WATER THAT PRODUCES OUR OWN VANCOUVER ISLAND CRAFT RAISED SALMON. 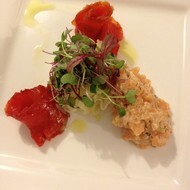 Our Craftsmen Farmers know about good salmon. They know how important it is to have access to the best Pacific Ocean water off the coast of Vancouver Island, water with strong currents, perfect salinity and glacier-fed cold. These waters are where good salmon comes from. Our Craftsmen Farmers also know how to spot quality, responsible fishing habits and an obsession with delivering good fish. They have found wild fishermen friends who share their passion for good salmon and who want to share in their unique process for delivering pristine, fresh-from-the-ocean fish to our customers. So now and for the entire wild salmon season we are proud to bring you the best Skuna Bay Wild Vancouver Island Sockeye we could find. 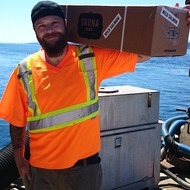 Harvested responsibly just like Skuna Bay, Vancouver Island Craft Raised Salmon. For you, our customer, the chef. Gold River, B.C. (May 4, 2014) —After eight grueling first round competitions pitting 28 chefs followed by two Semi Final battles, the Final competition at the Kentucky Derby in Louisville, KY was won by Chef Sarah Schafer from Irving Street Kitchen in Portland, OR. Chef Sarah beat the Eastern Semi Finalist Chef Edward Sura from Chicago’s Perennial Virant in a closely waged final cook off on April 30, 2014 at Sullivan University in Louisville. While Chef Edward presented an almost perfect execution of seared Skuna Bay Salmon crusted with smoked and ground Bluegrass Soy mash and home pickled baby corn relish, Chef Sarah’s dish, a 90 minute cured Skuna Bay Salmon with salmon belly potato latkes and Skuna Bay caviar delivered the win to this great western chef.